We are all unique individuals and hence develop our own views about ourselves. 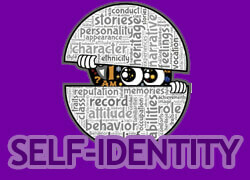 This gives rise to the concepts of self esteem and self efficacy which factor into our overall self concept. In this section, we will explore different factors that influence our self identities and discuss some developmental theories such as Freud’s Psychosexual Development, Kohlberg Moral Development, George Herbert Mead: The I and the Me, and Cal Rogers Humanistic Theory. The contents within this section closely follow the AAMC section: Psychological, Social, and Biological Foundations of Behavior Section: Content Category 8A.